Kiteboarding in Europe can be an intimidating experience... but every once in a while you stumble upon a spot that feels like home. There is a small, fairy tale city in Northern Portugal with a kite spot that will make your jaw drop. In today’s edition, we’re checking out Viana do Castelo, Portugal. Arriving at this spot is like unwrapping a present. Every step closer to the beach gets that much more exciting. Park, grab your gear, and follow the wooden boardwalk through the nature reserve. The kites floating up in the air mark the beautiful Viana Beach Center. And as you step over the sand dunes… the most beautiful little bay. That’s only part of the package. The city of Viana do Castelo is like something out of a story book. The people are warm... The food is delicious... And wandering the old city streets is like walking through a history book and a fairy tale at the same time. This hidden gem is teetering on the edge of becoming a kiteboarding hotspot. Viana do Castelo is a must visit for kiters making the trip to Europe. Here's everything you need to know about this kite spot followed by everything you need to know before you go! When the swell is good, wave conditions at Cabedelo beach in Viana are amazing! If the swell is small, it's an ideal place to learn and progress on a wave board. When the swell is big, this spot is a popular destination for surf competitions. The rock wall at the top of the kite spot creates a perfect, clean right hander that surfers, kitesurfers, and windsurfers are stoked on. For those that want a more wave specific spot, Moledo near Viana is a more challenging wave spot. The rock wall at the top of the Cabedelo beach kite spot creates a fantastic slick with incredible flat water, though the flat spot can get busy. The conditions near the beach are ideal for freestylers and kiters working on trick progression. Another nearby spot called Esposende is a flatwater river mouth that is accessible by boat, and has a great flatwater slick. Cabedelo Beach is the perfect beginner destination. First time riders can take lessons with one of the experienced instructors at VianaBeach Center, where they have a fully equipped center and every comfort a new kiter could hope for right next to the beach. Riders that are independent but still in the beginner stages will appreciate the large beach, shallow water near the beach, and friendly locals on the spot. The only downside is the cold water! 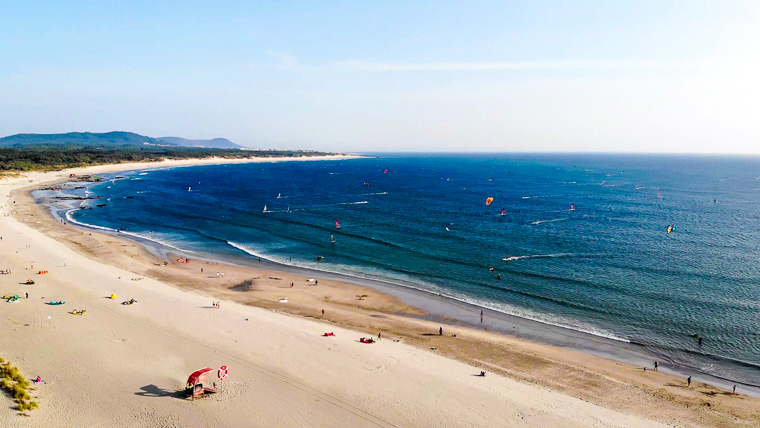 Viana do Castelo is a watersports hotspot with plenty to do on the water including surfing, SUPing, windsurfing, kitesurfing, sailing, and more. There's also some incredible off the water activities for those that need a break from the cold Atlantic Ocean. There's horseback riding, motocross, cycling, mountain biking, skate parks, pump tracks, and beautiful hikes. There's a lot to see in the city including Santa Luzia on the hilltop and a charming European village where one could spend days just wandering the small streets. Visitors can fly into Porto airport (1 hour away) or Lisbon airport (4 hours away). A rental car is ideal for those traveling with a group and that wish to visit multiple spots on the trip. Solo or adventurous travelers can make the trip by train or bus. Viana and the Cabedelo kite beach are both accessible on foot. This is a family and group friendly destination that can work for many budget levels! Viana’s kiteboarding season goes from May 1 to October 15, though there are windy days outside of the season. The best months for kiteboarding with consistent winds are June, July, and August. In the windiest summer months, you can expect about 25 kiteable days per month and plenty of sun! You could kite from 10am til sunset on a hot summer day! Wind is calmer in the morning and builds throughout the day, with windspeed in the range of 15-35 knots. The average windy day will be 20-30 knots, so come prepared with smaller kites! Thermal winds mean the forecasts is often inaccurate, especially on a N or NE wind. On a clear day, the wind will likely blow well above forecasted. Not sure what to prepare for? Get in touch with the team at Vianalocals or Viana Beach Center to get a read on the wind! Out of summer, windy days are less frequent and the conditions can be much less comfortable. Winter kiting is best for experienced riders only and those who can come when there’s a storm in the forecast. If you can survive without wind, the winter swell in this area can get very good. You always can surf when the wind isn’t blowing! Even in the heart of summer, the water temperature in the Atlantic Ocean can be quite cold. A 4/3 wetsuit is recommended for this spot. It’s important to prepare for the conditions - especially on the beginner side of kiteboarding when you're in the water a lot. Experienced riders can get away with a lighter suit – but a wetsuit is definitely needed! Because you’re in a windy coastal town, come prepared with layers in case it gets cold. When the wind is off and the sun is out, this is as good as it gets for a European beach holiday! But once the wind switches on, you might want that jacket! The main kite spot in Viana do Castelo is Cabedelo, which is where Viana Beach Center is. This is a beautiful beach surrounded by a pristine nature reserve. It's an incredible place to have the first session of your trip – if not every session. This is one of the few kite trips you can do without a vehicle, especially if you’re riding at Cabedelo. This picturesque bay is the watersports hotspot of Viana. Depending on the conditions, you’ll see kiters, windsurfers, SUPers, or surfers out on the water. The wind usually blows sideshore here, and side onshore towards the end of the bay. The rock wall at the top of the beach creates an impressive slick spot. When there’s no swell, but when the waves are brewing, you can expect a perfect, long right hander! If you like bigger waves, ride deeper in the bay near the rocks! Esposende is approximately 15km south of Viana and has a river mouth with a flatwater lagoon. This is the perfect spot for freestylers but is only accessible by boat and can get crowded. Ask the crew at Viana Beach Center or a local kite center if you’d like some help organizing a boat. You’ll set up and launch on the south side of the lagoon and be riding in shallow sideshore conditions. This spot is great for every level of kiter including beginners. If the lagoon gets crowded, you can pop out over the sand dune to ride in the ocean. Riders looking for a wave specific spot should head up to Moledo. It's about 25km north of Viana near the border to Spain. This spot is not recommended for beginners as the waves can get heavy. Those who are ready to take on a more challenging spot will definitely want to head up here to check it out! Northern Portugal has some incredible spots, but the rest of Portugal is full of kiteboarding destinations. Take a look at our Lisbon Spot Guide for information on some of the other kite spots in the Lisbon area. Cabedelo is a spot that works for riders at every level – from first time kiters to experienced pros. This sandy beach, kite center, and the shallow water close to the beach make this it a perfect spot for lessons. You’ll also see advanced riders and the talented locals throwing down here when the wind is pumping. This friendly community of local kiters welcomes every level of rider with open arms. Riding style is anything and everything! Freeride, freestyle, directional, strapless freestyle, and foiling at mid or high tide. The primary riding style here will depend on the wind and swell. The conditions are gentler earlier in the day – best for foilers, beginners and freestylers. When wind is pumping in the afternoon it’s big air heaven. When there's swell, there's a perfect right hand wave for directional riders. Viana Beach Center has all the facilities a kiter might need. If you forgot something at home, you’ll find what you need here. There’s a lesson center on the beach for all watersports. There's gear rental and storage, a compressor, showers, bathrooms, lockers, wifi, and a cafe! There's even a rooftop deck protected from the wind so you can enjoy the view and chill after your session.When you first arrive, you'll have to lug your kite bag down the path.. But you can rent a locker so you have all your gear at your fingertips at the beachfront! There's not much to worry about here at Cabedelo. There are some rocks in the middle of the bay near the beach to avoid. The bay curves so if you run into trouble, you'll pop out on the beach at the bottom and can walk back. The water is cold so be sure to wear the appropriate thickness of wetsuit. There are lifeguards and a safety boat onsite throughout the summer for backup! When in doubt, you can get a briefing from the crew at Viana Beach Center before you start your session. Viana is something special. This little city was rated 5th best beach town in Southern Europe this year. Many visitors – especially watersports aficionados - have made the trip back for more than 20 years. Once you come, you’ll see why! This spot has so much magic that I couldn't stay away for long... Read more about my experiences in Viana do Castelo on my blog. The two most convenient airports to fly into are Porto [OPO] and Lisbon [LIS]. Porto is only an hour drive from Viana do Castelo and Lisbon is approximately 4 hours away. Both are international airports and offer many flight options from North America. Viana is one of the few kite spots that you can visit without a rental car in the summer months. A train or bus will get you to the city. A taxi will get you to the kite center to check your gear into a locker. And as long as you’re staying in the city or in Cabedelo beach, everything is accessible by foot or on a short ferry ride. If you’re renting a car, you’ll be able to visit many more of Portugal’s kite spots. 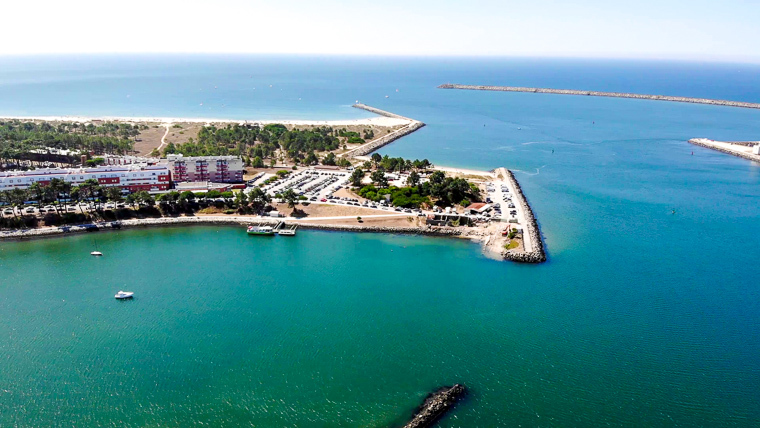 There is convenient free parking at Cabedelo beach and lots of opportunities to explore this beautiful region. If your trip is all about kitesurfing, you may want to stay at Cabedelo beach close to the kite spot. For those who are traveling in a mixed group of kiters and non-kiters, the city is the ideal spot to stay. You can explore on foot with dozens of delicious cafes, restaurants, culture, and history on your doorstep. There are plenty of options like hotels, hostels, and private rentals through AirBNB. Hostels start at around $25 per night for a bunk bed in a dorm and Hotels range from about $50 to $300. You can camp by the beach in Cabedelo at Orbitur Camping and rent a bungalow or bring your own tent or campervan. The campsite here is full of wind chasers and perfect for families. I stayed at Hotel do Parque, around 5 minutes drive from the kite beach and a short walk to the city. It’s a comfortable modern hotel with great breakfast, nice views, free parking, and a pool. I’ve also stayed at Hostel Maçã de Eva. It's right in the heart of the city, 15 minutes from the kite spot on foot and ferry, and ideal for exploring town. Be sure to book your accommodation well in advance if you’re traveling between June and August. It's a busy time of year to travel in Portugal! This is the sort of place where it’s easy to spend most of your day at the kite beach. Luckily, Cabedelo beach has two great food options. Aquario Restaurant & Bar has incredible food and an amazing sunset view of the water. You’ll find kiters congregating here after they’ve worked up an appetite for a hearty meal. If you want to stay by the kite beach, there’s a café at the Viana Beach Center with a healthy menu designed with sport in mind. Their salads, pasta, wraps, and coffees are a great way to get fueled up for your session. After session, it’s the ideal spot for a cold beer or cocktail. While you’re in Portugal, try the bacalhau, which is the salted codfish. This has been a Portuguese tradition for more than 500 years. You can’t go wrong with fresh seafood here, but the names on the menu can make it hard to figure out what you’re eating. Don’t be afraid to ask or use Google Translate! Some of the best meals I had were ordering mystery dishes. Coffee and a pastry are almost a way of life here. Don’t forget to try the Pastel de nata and the Bolas de Berlin, a sweet donut style dessert. They say the Bolas in Viana are the best in the world! Port wine also originated in the nearby city of Porto. You won’t want to miss out on trying the local port and wines while you’re here! There is a lot to do in Viano do Castelo both on and off the water. SUP, surf, sail, bodyboard, wakeboard… the ocean is at the heart of Viana. It’s a great place for a morning surf while the wind builds. Off the water, you could easily spend a day or two exploring the streets of Viana. Beautiful architecture, churches, cafes, shops, and up on the hill… Santa Luzia. You can’t miss it. It’s the first thing you see as you get closer to Viana and it’s always there overlooking the spot. You can hike up, take a cable car, or drive up. The view from here is unparalleled. If you walked up, definitely reward yourself with a snack or a drink on the patio at Pousada Santa Luzia. If you didn’t think the view could get better, this is the cherry on top. Portugal Active offers many outdoor experiences including horseback riding, mountain biking, fat bikes, motocross, and more. There hiking in this region is a unique experience. This is a part of the Camino de Santiago which is a famous pilgrimage in Europe. Think the European version of the West Coast Trail or Appalachian Trail. This 500 mile trail brings hikers from around the world. If you see someone with a walking stick and a backpack, they’re on the trail. You can do a small section of the Camino de Santiago in Viana – even a beginner hiker can do a section of this route and get a sense of the history involved. There are kite spots all over this beautiful world, but this is easily one of my favourites. It’s this ideal combination of stunning nature, a romantic, historical city, and locals that are so kind you’ll feel like one of the crew right away. This is kite community at it’s warmest – and everyone is welcome to experience it. If you’re bringing friends and family that don’t kite? They’ll be blown away by this sweet little city. I can’t recommend this spot enough! Don’t forget to check out the Viana do Castelo video spot guide and read more about my experience in Viana on my blog. If you have any questions about this kite spot, please send us a message or reach out to me on social media via Facebook or Instagram. We look forward to sharing the next Destination with you!